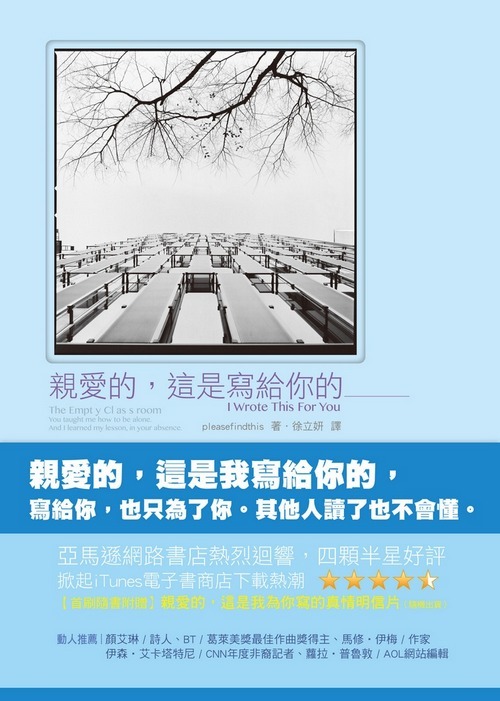 It is with great pleasure that we announce that I WROTE THIS FOR YOU by pleasefindthis is now available translated into complex Chinese characters. Last year, we awarded the translation rights to Taiwan’s prestigious Yuan Liou Publishing. It is now available in bookstores in Macau, Singapore, Taiwan, Hong Kong & Malaysia. Needless to say, the creators and I are very pleased and so happy that this wonderful book of poetry can be shared with an even wider audience. Now, of course, a favour to ask: if you live in that part of the world and happen to be near a bookstore which carries it, would you so kindly take a picture of yourself with it and tweet it to us? You can reach us at @CentAvePub and @iwrotethisforu. It would mean so much to ‘see’ it in the hands of a reader. And I leave you with the promotional video for the book.